Douglas Laing produce some damn fine whisky, a great deal better than many, and now I’ve had this Rock Oyster Cask Strength for a week or so and have had a few glasses I can confirm that they have absolutely hit the jack pot with this. 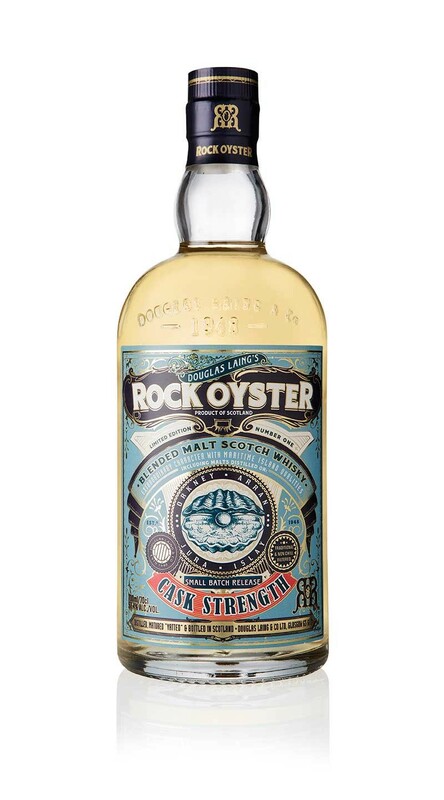 The Original Rock Oyster is a lovely dram, I remember the first time I tried it, with posh fish fingers, and was blown away with how complete it was, like Big Peat it offers an enormously complex dram but also something a beginner could sip with gusto. Now I don’t get often excited by a new version of a whisky I’ve already tried but I bought a bottle of this the day it came out because, in part, because I’ve been drinking a lot of stronger whiskies of late and fancied a cask strength blend, and partly because it’s my birthday, or was, and so I could blag this from Mrs Apocalypse, sweet indeed. Rock Oyster Cask Strength is 57.4% and is all natural. I have tried this neat and it took my head off so let’s assume I’ve taken each of the drams I’ve had with between 20-30% water. Nose. Smoke blast but sweetness too, sage and sea salt on heavily buttered brown toast, there’s also a sweet jammy note too, Gooseberry and Apricot. Palate. Salty brine and smoke hit you at first but allow this to sit for a bit and candyfloss and burnt toffee come through, there’s melted butter, cracked black pepper, the sort that takes your breath away when you bite into a piece, salted caramel chocolates and a touch of vanilla pod. Finish. More heat than I expected, it lingers a while no doubt due to its power, a little white pepper, softer than on the palate and vanilla flavoured candy floss kicks about for a few minutes too. This whisky is the best fifty quid you’ll spend on a single bottle this year and as it’s proper hefty it’ll last a while too, in fact if I may be melodramatic I’m pretty sure Douglas Laing is milking the joyous tears of a mermaid to make this and it’s not really whisky at all, braw stuff, well done.